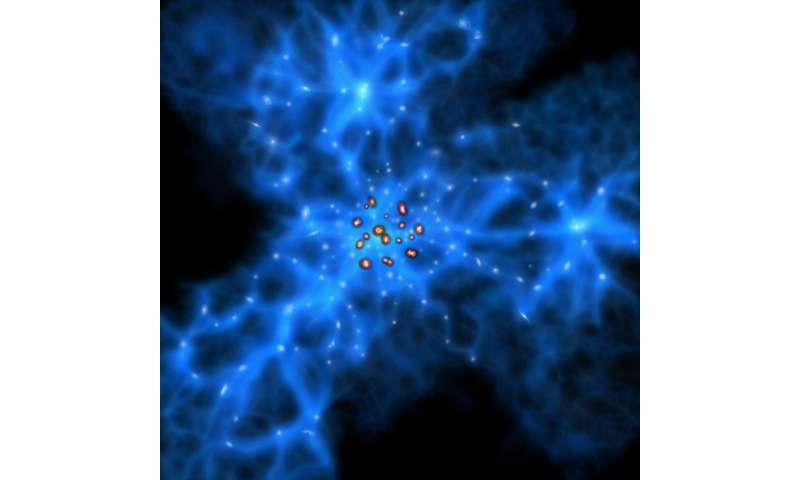 The team found that their young monstrous galaxies seemed to bewere located right at the intersection of the dark matter filaments. This finding supports the model that monstrous galaxies form in areas where dark matter is concentrated. Astronomers are clearly deranged, consumed by dark assumptive nonsense. Dark matter indications are simply a consequence of concentrated matter, as evidenced by the dark matter halos surrounding galaxies such as the Milky Way. Matter concentrations causes distortions in the surrounding non-existent 'space-time' that diffracts light indicating the presence of dark matter. It is simply the reverse of the assumptive nonsense. And more matter concentrated begets more matter, so galaxies form in clusters. I can go on an on, but it won't matter. Astronomers are deranged. Why don't you work as an astronomer then? Because your ideas are too "correct" for them? perhaps dark model models are erroneous... but I think the term "deranged" is far too strong sir... doing mass accounting on a galactic scale is difficult work and errors can be made! theorizing is not a sign of derangement if you continue to test your theories! Either they are or you are. Is "monstrous" still a technical term outside of 2nd Edition? That would depend on how many of the tests give you a negative result that you refuse to accept. After reading the above article...no. They will continue to assume there is invisible matter out numbering real matter by 4:1. And continue spending billions trying to find it. Actually, I don't think they want to "find it". Think of the ramifications of that, it means their government funding would dry up & a bunch of theorists in that field of research would get pink slips, they want the issue, not the answer. This is not a field for which there is any great demand, get into Engineering if you want that. And those of us with common sense will continue to point out how rediculous this is and have to deal with ever so faithful supporters of the flawed theory that lead to the DM hypotheseis in the first place. Common sense is insufficient for the problem at hand, science is needed. You have no evidence disproving DM and no alternative theory. The shape of the cluster observed by the Subaru Telescope indicates the presence of a huge 3D web of invisible dark matter. This dark matter filamentary structure is thought to be a progenitor of large scale structures in the Universe. One of the best known examples of large scale structure in the modern Universe is the cosmic Great Wall, a gigantic filamentary structure spanning over 500 million light-years. The filamentary structure in SSA22 could be called a proto-Great Wall. .....OK then, we'll start with you..........prove you exist, or if you prefer the inverse alternative, prove you don't. This finding supports the model that monstrous galaxies form in areas where dark matter is concentrated. RC, the biggest problem Docile was up against was his competition, handle of Axemaster who likes bragging about teaching a physics course at MIT, as it turned out it was 1st semester physics which has nothing to do with nuclear physics, but he was hoping no one would figure that out, I caught him when I did a little data mining to find out who he really was. You see, Axemaster wasn't about to let Docile upstage him, after all Docile had no MIT affiliation, and Docile was continually preempting material Axemaster considered his personal domain, the Cosmic Fairy Dust narrative of Dark Matter, alias Funny Farm Science. Common sense need be the first step, not avoided altogether. There is billions of dollars wasted and 60+ years of evidence it doesn't exist, it's time to move on. And quite to the contrary of your claims, there are alternatives and they further eliminate the need to rely on magic fairy dust. Go away little boy, CD85 has twice the grasp of physics you do. This doesn't bode well for you. Ouch, can't get much more insulting than that zinger! Nice link Tux, forgot about that one. It's neat how these groundbreaking observations never come up again....when they screw with faith in a model. Thanks bschott. It felt a bit cold and lonely in those early days. Nice to have a few other credible voices joining in lately. ...........yeh, it's almost breathtaking that dialogue between individuals can occur on this site less all the name calling & profanity. I've got a couple of questions for you bshott, but I don't have time right now to think through how I want to ask them. It deals with "particle density" along magnetic fields that you mentioned a couple of posts above, I want you to expand on it. I'm trying to imagine I know where you're going with it, but I'm just not quite there yet & it's already been a long day in the lab. How do any of you explain the angular momentum of stars within galaxies being the same from the center of the galaxy to the outer reaches of the galaxy? Thanks in advance for your limitless wisdom and testable theories. The galactic disk behaves like a solid plate, Alfven used the Faraday or homopolar motor analogy to describe galaxies. The USS described in the paper I linked above explains how the structure is held together by electrodynamic nanodust which creates skeletal structure in the plasma. .....and whoa, what have we here but another member of the 1 Star Vote Brigade checking in. Just can't leave science to those who can do it.